Yaroslavsky Railway Station in Moscow by F.O. Schechtel. 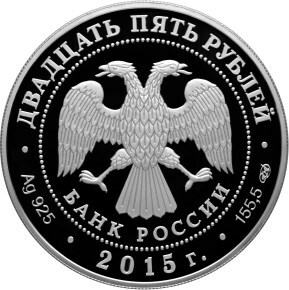 The obverse: in the centre – the emblem of the Bank of Russia [the two-headed eagle with wings down, under it – the semicircular inscription “БАНК РОССИИ” (BANK OF RUSSIA)] framed by a circle of dots and inscriptions along the rim – on top: “ДВАДЦАТЬ ПЯТЬ РУБЛЕЙ” (TWENTY FIVE RUBLES), below: to the left – indications of the precious metal and its fineness, in the centre – the year of issue “2015 г.” (2015), to the right – the fine metal content and the mint trade mark. 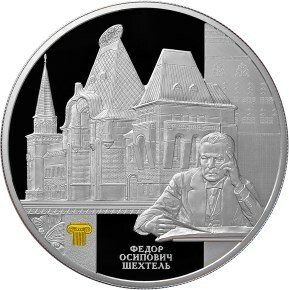 The reverse: to the right against a matted background of a wall – the relief portrait of F.O Schechtel with an opened album before him, below in the centre on a section of the mirror field – the inscription in three lines: “ФЕДОР ОСИПОВИЧ ШЕХТЕЛЬ” (FYODOR OSIPOVICH SCHECHTEL), to the left – the part of a wall with fragments of moulding and the colored image of a capital of the Ionic order, in the background – the building of the Yaroslavsky Railway Station in Moscow. The artist and sculptor: F.S. Andronov.